The Cuban population in the U.S. is centered in Florida, home to seven-in-ten of the nation’s 2 million Cuban-origin Hispanics. In the 1960s, the state’s Cuban immigrant population boomed as many left the island after Fidel Castro’s rise to power. 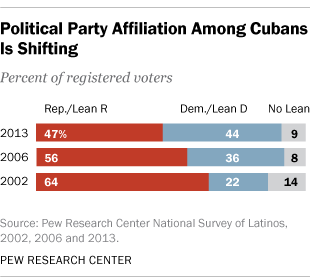 The concentration of Cuban voters subsequently helped push the overall Hispanic vote toward the Republican Party in the Sunshine State. In 2004, for example, Republican presidential candidate George W. Bush won 78% of the Cuban vote in Florida, compared with 56% of the state’s Hispanics overall.